Civita di Bagnoregio perches precariously on an outcrop of rock surrounded by deep ravines in Lazio, the region that encompasses Rome. Frequent rock falls have earned it the name "the dying town" and most of its inhabitants fled long ago, to be replaced by a small colony of artists, expatriates and boutique owners. The village, 100 miles north of Rome, now intends to charge a three euro entrance fee on visitors in an attempt to build up a fund to pay for vital engineering work and structural repairs. It is thought to be the first town or village in Italy to start charging an entrance fee – Venice has considered the idea in the past as a way of controlling the crush of tourists that invade the lagoon city every day, but the idea has proved too controversial to implement. 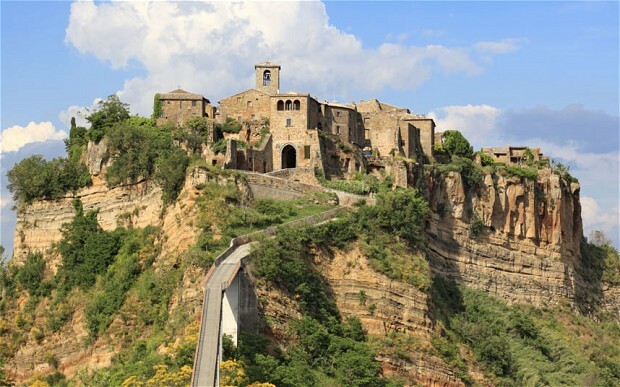 The tourist tax will be easy to enforce in Civita di Bagnoregio – the only way to access the tiny village is via a long pedestrian bridge that spans a deep ravine. The decision to introduce the charge was taken in the light of recent geological reports which painted an alarming picture of the precarious state of the village, which is built on crumbly tufa rock, a type of limestone. "The money will be used for urgent structural maintenance," said Francesco Bigiotti, the mayor of the village along with its sister settlement Bagnoregio, where many of its former residents had to move to. Cuts to government funding, implemented by the technocrat government of Mario Monti, the prime minister, also drove the decision to start charging for entrance. "It is clear that we must find new funds that will enable us to act quickly and independently," the mayor told the Ansa news agency. "We need to intervene and deal with the situation resolutely." He said new fractures had appeared in the foundations of the village which needed to be attended to "before they get any wider". The ticket scheme is expected to be up and running later this month. 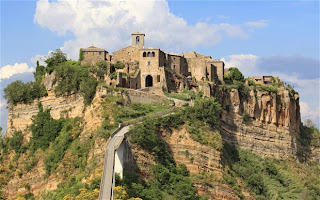 Civita di Bagnoregio was founded by the Etruscans around 2,500 years ago but the tufa plateau on which it sits has been eroding for centuries. The town went into serious decline from about the 16th century, with many houses simply sliding off the edge of the cliffs into the gorge below. Earthquakes accelerated the damage. Italians know it as "il paese che muore" – the dying town. But the history of abandonment has preserved the village virtually as it was in the Middle Ages, making it a popular tourist attraction. Its year-round population is about 15 but that swells to about 100 during the summer, when cafes, restaurants and boutiques open up for the tourist trade.